Introduction: What Influences What We Wear? Clothing worn by all people is influenced by the climate, available materials, and cultural traditions which include social status, group identity, and religion. Climate: People living in a desert environment often covered up in loose clothing to protect themselves from the sun and to keep cool. White clothing was cooler than dark clothing in the sunlight. And head coverings were important for protection against the sun, too. Fabrics: Five main fabrics were available for clothing. Cotton was a cool fabric. In winter or in cold environments, clothing was commonly made of wool. Camel hair was also woven into clothing for cold weather. Some clothing was made from plant fibers called linen. Silk was imported from China or Persia and was very expensive, so only the rich could afford it. Traditions, status, and group identity: Cultural traditions were also important in style of clothing. 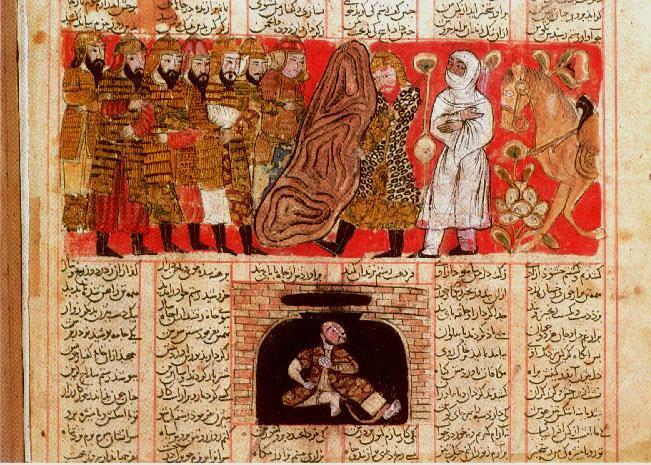 There were many differences in clothing throughout the medieval Islamic World. In each culture, clothing showed the social status of its people. Married and unmarried women might wear different clothing or head coverings. Young girls would not be required to wear the clothing of older girls nearing the age of marriage and married women may wear another style of clothing. Rich and poor, educated and uneducated, military or civilian might wear different styles of clothing which showed who they were and their occupation or status. Clothing worn out in public would be very different from clothing worn in the home, especially for women. (Long before Islam, Arab women were usually kept away from mixed society. But in Turkey, women had much social freedom.) A Muslim student, a scholar or judge would wear appropriate clothing showing his religious status. An older man would have a beard while a younger man might not. And a slave would wear very different clothing than a master. Moreover, clothing was also part of a tribal or group identity. People from one tribe, village, or culture traditionally wore one type of clothing to show their group membership. Finally, clothing would differ as to the situation one was in. Clothing while doing hard farm work, for example, would be different from clothing when going to a mosque. Influence of Islam: But there were also similarities that were dictated by the Qur'an. The Qur'an and the sayings of the Prophet Muhammad had much influence on the clothing of all medieval Muslims. As Islam spread across its vast empire, traditional clothing styles were affected by the requirements of Islam. Look at the following paintings. By looking at these images, what can you generalize about Muslim women's clothing from Andalusia (Spain) to Persia (Iran)? Are there similarities and differences? Are any of these styles similar to modern clothing? A veiled Berber woman in Andalusia (Muslim Spain) playing chess with another woman. Image from The Book of Chess, Dice, and Board Games by Alfonso X El Sabio, dated 1283. A woman in Andalusia (Muslim Spain) playing chess with another woman, both with henna on their hands. Image from The Book of Chess, Dice, and Board Games by Alfonso X El Sabio, dated 1283. Persian women (shown in preparation for a funeral at a home) painted by Shaykh Zadeh from a Khamsa of Nizami, 1494 in Herat. A Persian woman with pants covered with a robe and head and face covering. From "Rustam saves Bizhan from the well" in Shah-nama (Firdawsi's 'Book of Kings') by Ali b. Husayni Bahmani, Shiraz, 1330. Turkish women were veiled and separated from the men in this mosque scene. 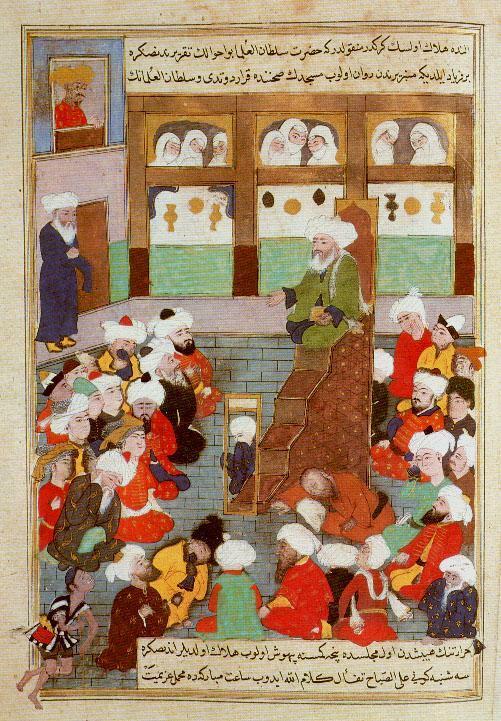 Topkapi collectionShaykh Baha'al-Din Veled preaching in Balkh Jami' al-Siyar, 1600. Hazine. Ibn Battuta was a traveler in the 14th century. He tells us about women's clothing in many of the places he visited: In Turkey he tells us that the women did not veil themselves. "About 1118 AD [the founder of the Almohad dynasty in Morocco], returned from the East... He seems to have dedicated himself chiefly to studying ... theology ... and was convinced that [North African] life was not what it should be. The moral laxity of Marrakesh [the capital city of the veiled Almoravids] scandalized (shocked)him so much when he was there that the sight of the Emir's (the prince's) sister riding unveiled on horseback through town, accompanied by her women, caused him to throw her down..." (Arabs in Europe, p. 31, quoted in Sadar & Davies: Distorted Imagination).